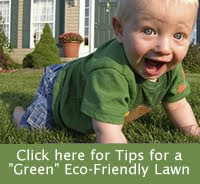 Metro DC Lawn and Garden Blog: How to save 150 gallons of water a day…. How to save 150 gallons of water a day…. That’s the headline I saw on a blog post recently so, of course, I had to click over to read it. I’m fairly certain that we don’t even come CLOSE to using 150 gallons of water a day in our home, so I was interested to see how someone could write an article about saving that much. But the writer, Michele Hallahan, writing on LivingGreen Magazine, DID appear to do her homework. Water use in the USA is typically around 180 gallons per day per person. Switching to low-flow showerheads can save you 12.5 gallons every time you take a 10 minute shower. That’s 50 gallons per day in a household with 4 people showering daily! Nationwide, irrigation uses more than 7 billion gallons of water a year! Irrigate your garden only before 10am or after 7pm in order to make sure your thirsty plants get the most from your precious water! Save up to 60 gallons per day by watering wisely. Front-loading washing machines use half as much water as top-loaders. Switch to an Energy Star rated machine to save up to 12.5 gallons a day. Run your dishwasher only when full. Save up to 6.5 gallons of water per day. We are definitely good about saving water in our landscape. Not counting what we get from our rain barrels, I would say that we don’t even use 60 gallons of water all MONTH in our landscape. And we save a lot by waiting until our dishwasher is full and not running the extra cycles. But it’s nice to have the reminders for some of the other easy changes. You will save even more water by reducing your energy usage and your meat consumption.